Ca y est, nous y voilà. Depuis 18h00, le premier P500 mode Cochons est lancé!!! Au programme, les reprints des produits en rupture les plus demandés. Je vous rappelle que vous n’avez que jusqu’au samedi 2 février 2019 à 12h00, heure française, pour atteindre l’objectif fixé pour financer cette campagne de P500. Cette objectif est fixé à 15 000 euros. S’il n’est pas atteint, rien ne sera imprimé et nous considérerons que les produits que nous vous proposons peuvent passer en rupture définitive. Vous ne serez prélevé que si cet objectif est atteint. afin de valider ce nouveau mode de financement de nos produits. Got my receipt too, hope is this good news? Same for me, I’ve received 2 mails indicating that the transaction was processed….hoping we were close enough from the target to have validated it. Moreover, as I’ve already said, it’s easy to sell few dozen of each set to web stores and this represent more that the missing amount. Waiting confirmation from the Pigs…. I’ve just received a receipt for my payment via email. Looks like it’s going ahead even though it didn’t reach the target. Here’s hoping.. Or am I missing something? €12,500 is pretty good going for 6 days and not far off the target. Just threw in my wallet. Good luck pigs. The same customer may have ordered products that have reached the limit and others that have not. I cannot change the amount of the payment. So either I validate everything or I don’t validate anything. Le même client peut avoir commandé des produits qui ont atteint la limite et d’autres non. Je ne peux pas modifier le montant du paiement. Donc soit je valide tout, soit je ne valide rien. Soyons positif. Que nous atteignons l’objectif ou non, cette campagne sera pleine d’enseignements. Nous comprenons mieux vos attentes grace à elle. Cela nous permettra d’affiner nos offres dans le futur. Il y aura bientôt un autre P500 mais cette fois-ci pour des nouveautés. Let’s be positive. Whether we achieve the goal or not, this campaign will be full of lessons. We better understand your expectations thanks to it. This will allow us to refine our offers in the future. 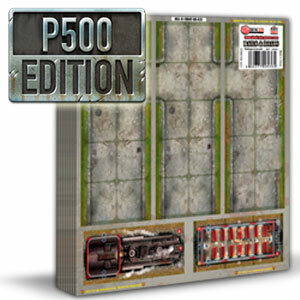 There will soon be another P500 but this time for something new. I understand the 6 day limit, you really have only two choices this or a crowd funding (KS for example) and the crowd funding costs money when they take a cut off the top. What I admit I found odd on this was the « all or nothing » approach to the full list/mix of products. This means if folks wanted product X but not product Y the lack of orders for Y also kills X. If you are willing to share, was this a manufacturing issue that caused this creating a group of mixed products? En fait, le délai n’est pas un choix mais un impératif technique. Exactement 6 jours après la commande, si nous n’avons pas validé le prépaiement, celui-ci est automatiquement annulé. In fact, the deadline is not a choice but a technical imperative. Exactly 6 days after the order, if we have not validated the prepayment, it is automatically cancelled. J’avoue être assez surpris du choix de samedi 12h00 pour la clôture de l’objectif. Pourquoi se priver des 2 jours du WE pour financer ces P500? Reste moins de 48h et la moitié de la somme attendue n’est même pas atteinte. J’espère que ça ne condamnera pas définitivement les box de rangement si la P500 n’est pas validé. J’espère que vous avez aussi contacté les grosses sociétés de vente de jeux du Web, qui seraient forcement partante pour acheter au moins une dizaine d’exemplaire chacune, ceci ferait bondir le montant du P500 de plusieurs milliers d’euros ! If the objective is not reach, they relaunch a quick p500 with only the items that have been worked with a lesser objective. If I have well riden the explanation of the devil pig p500. I just realized that a single objective was given. Does this mean all six items either make it or don’t? 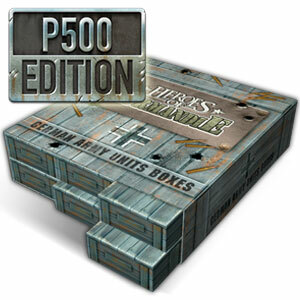 Is each P500 an all or nothing? Or is it by product? Thanks a lot, Guillaume! Excellent news! Pour la boite de rangement de tuiles de terrain, nous allons ajouter ces autocollants. 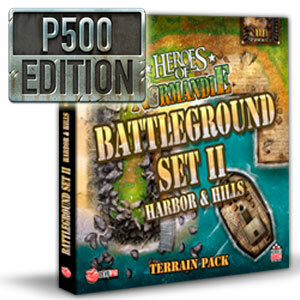 For the Battleground Storage boxes, we will add these stickers. 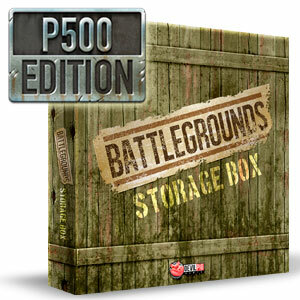 I would also like to see an updated sticker sheet for the Battleground Storage boxes! There are no stickers for Shadow Hunters, Radar Station & Factory, the Ventura and the upcoming Woods & Hills Terrain Pack. And what about the Arnhem and Vercors maps? Anyway, there’s still a lot of room on that sheet to replace some of the blank stickers with dedicated ones. L’objectif est ambitieux mais nous comptons sur vous! The objective is ambitious but we are counting on you! We will give you a short communication on the new generic WW2 storage which is the only new feature of this P500. Tomorrow or the day after tomorrow at the very latest. Nous allons vous faire une petite communication sur la nouvelle boite de rangement générique qui est la seule nouveauté de ce P500. Demain ou après-demain au pire. I will second the call for some more info on the new generic WW2 storage. At least a list of the unit stickers if not the graphics would be helpful. I am also curious what the lid of one of the drawers looks like. Seulement 5 jours pour atteindre 15000€, ça me semble compliqué. Good luck – I have all of it so going to wait for P500 N°2. Just curious, has this been announced to the old Kick Starter list? I didn’t see it but maybe I missed the notice. Vous n avez pas une fonction pour écrire à tous les membres du forum pour faire une annonce à tous vos clients? I like the idea of this new method, I am just not in need of any of these items. However I wish you the best of luck on this first try of the P500 process. Question. Peut on modifier sa commande pour ajouter de choses dans les jours à venir afin d aider à débloquer sans repayer les 10 euros de fdp à chaque fois ou est ce que ce n est pas possible? Je croise les doigts pour qu on atteigne le seuil. J’espère que l’objectif sera atteint, je serai bien dégoûté de rater cette (dernière ?) Chance d’acquérir ces produit fort pratiques quand on a pratiquement toute la gamme a ranger !